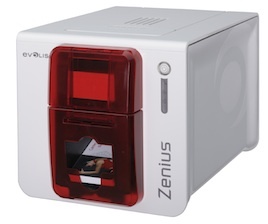 Evolis announced the launch of ZENIUS, its next-generation card printer that is focused on the user. With the new card printer, Evolis offers a single-sided color printer that is compact, modular and designed to be easy-to-use. With ZENIUS, Evolis has redesigned its printing engine and overall environment with a new design, software architecture and enhanced consumables. With these additions, printing cards and badges is designed to be simple to serve a variety of applications: employee IDs, loyalty cards, student IDs, payment cards, transportation passes, and more. The new Evolis Premium Suite software architecture includes a configuration and printing manager that aims to improve communication between the printer and the user. The printer can be monitored directly from the user’s interface through pop-up notifications that provide information on the printer’s status. The Evolis High Trust range of consumables has been designed to enhance graphic performances and simplify routine tasks. For easy handling, the new ribbons are supplied in a cassette that houses an RFID chip. This helps the printer identify the ribbon type and configure all settings accordingly. The new printer is also designed to be compact and quiet so it can fit at a welcome desk, a sales counter, or an office desk. ZENIUS is an eco-designed printer that uses recycled material that can be recycled. The printer also is a low-energy system as it complies with the stringent ErP European directive. ZENIUS is now available in its Classic version. An Expert version will be available end of 2011, offering the capacity to combine multiple encoders within a single system. This array of encoding options will allow the personalization of technology cards, from tamper proof access control badges to payment cards.